Melt the butter in a medium sauce pan, then sauté onions on medium-low until soft (about 20 minutes). Once the onions are soft, add 2 tbsp flour to the onions and mix well. Add the beef broth, sugar, and water and bring the mixture to a boil. Let simmer for 45 minutes. Add the rest of the flour to the soup until broth has thickened into a sauce. Preheat the oven to 350F. Slice the bread in half and layer the beef onto the bread. Cover the beef with French onion soup mixture and top with cheese. Bake at 350F until cheese is melted (about 10 minutes). This looks yummy! 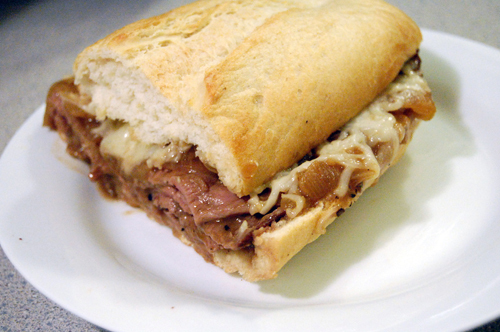 My husband and I love french onion soup but never thought of making it into a sandwich. What a creative mind you have. 🙂 Wow you’re going to South Africa! So envious!! Mmmm I love sandwiches and this one looks awesome. Have a great trip- everyone I know thats gone to SA has loved it! Gotta love a good messy cheesesteak. I’d want a little extra broth for dipping too. Hope your trip is fabulous. Oh, my god. That looks sooo melty and wonderful. Thanks for the add on foodbuzz!! Wow, I would love to eat this! Excuse my language – HELLS YES1 This sandwich looks like heaven dropped in a left a present. Ok, I salivate in my own corner now over this – have a safe trip!! Love me a good sandwich. That looks like it would hit the spot right about now! This is the epitome of comfort food for me! What a great reinterpretation of the cheese-steak sandwich. When I order a steak sandwich I always hope it will arrive on the table looking like your wonderful example – but it never does. I will have to be guided by your recipe and make my own cheesy oniony steak sambo. 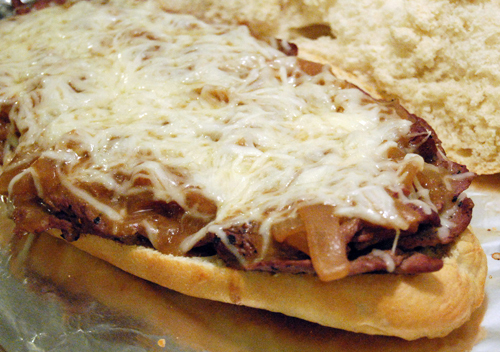 I come from Philadelphia which is famous for it’s cheesesteaks, and yours looks pretty darn good. You’ve inspired me to make these tonight for the gang! Wow, I’ll bring the napkins. This does look fantastic and totally unique. Great job! Have an awesome time in South Africa!